Q: I want to start redecorating my home and I'm particularly fond of rooms that have a lot of patterns mixed -together. I like a warm, cozy look and the combining of various prints seems to be an ideal way to accomplish this. tiveu, but the overaii effect is â€¢ unattractive. In other cases, the combination of prints seems to be not only natural, but interesting and unique. This is what I am after. Can you give some guidelines that will help me achieve this look? A: I thoroughly agree with you that a room with a mix of many patterns can be very successful or a very obvious disaster. Mixing patterns is a lot more daring than using only solids, or combining them with one print, which is the reason most people do precisely that. There are few risks. It's safe. If done well, the effect of comÂ­bining patterns is very appealing and can give you the warm and coÂ­zy look you're after. It does, howevÂ­er, require a lot of forethought and some skill. You should begin by selecting the primary print to be used in the room. This can be a dramatic fabÂ­ric, such as a colorful, floral chintz, but the dominant pattern, as well as the secondary patterns, can be many other things as well. A few of the other possibilities are wallpaÂ­per, an area rug, a tapestry, a large piece of art, flooring such as ceramÂ­ic or vinyl tile, a stenciled design on the walls and ceiling, or furniture that has been painted or in other ways decorated. Lighting can even be used to create patterns. Assume that the major pattern is a large-scale floral chintz. Use it genÂ­erously throughout the room. 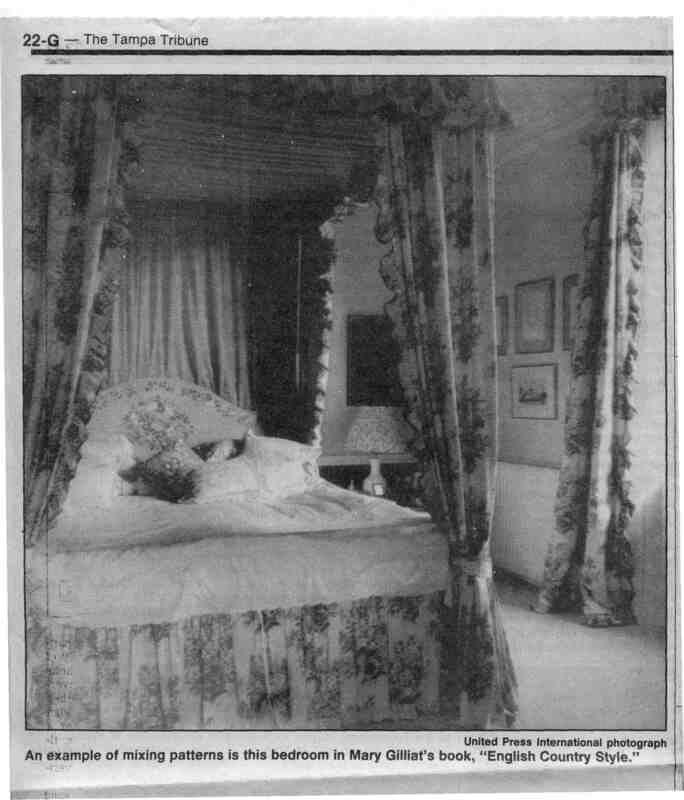 For instance, in a bedroom, you could fabricate the dust ruffle, canopy and draperies with it. Utilizing the chintz sparingly will not display the fabric to its best advantage. Next, decide what type of patÂ­tern will best complement it. A geoÂ­metric, stripe or small-scale floral would be possibilities to correlate with the large, floral design. The colors should relate, but the scale of the secondary pattern should be difÂ­ferent. In the bedroom pictured, taken from designer Mary Gilliat's new book, "English Country Style" (LitÂ­tle Brown, $24.95), the small two-toned check is an interesting comÂ­plement to the large print. 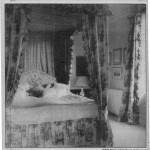 Using it on the inside of the canopied bed, and as a backdrop, is very effective. The painted headboard adds anÂ­other pattern to the room. It's also a floral, like the chintz, but because the scale is smaller, and there's a lot of open ground, it works well with the other patterns. Eyelet fabric, with a very small tone-on-tone design, covers the bed. This provides additional pattern inÂ­terest without adding another comÂ­bination of colors. A various mix of miniature prints in coordinating colors, as well as lace and eyelet, are used for throw pillows of differing shapes and sizes. _Â Â Â Â The fabric lamp shade, photoÂ­graphs on the table, and the prints on the wall are additional sources of interest in the room. The effect is warm and cozy, but even with using as many patterns as were utilized here, the completed product is attractive. A lot of thought went into the mixing of these prints, but it doesn't appear to be overly contrived. The various patterns seem to be a natural, yet unique, combination. Gilliat's book provides several examples of this seemingly effortÂ­less mixing, a trick that needn't be labeled or representative of the English country look, though that style naturally lends itself to the particular charm of pattern mixing. The key to achieving the look is to choose the primary pattern you want to use in the room. Let it be the focal point and dominate. The other patterns should complement it and add interest, but should not fight for attention.